IPO or an Initial Public Offer (IPO) is the first sell of a stock by a private company to the public company. In this way a company can raise money by issuing either debt or equity. IPO or stock market launch is a type of public offer in which shares of a company generally are sold to the institutional investors that in turn, sell to the general public by a securities exchange for the first time. In this way, a private company transform into a public limited company. IPOs are often issued by smaller or younger companies seeking the capital to expand, but can also be done by large privately owned companies looking to become publicly traded. 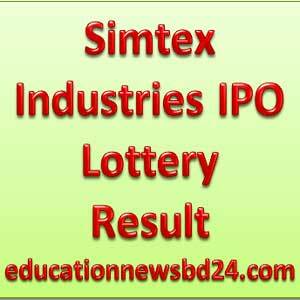 Simtex Industries Ltd-IPO Lottery Result has been published. Download Simtex Industries Ltd-IPO Lottery Result here. After ending of application of Initial Public Offer(IPO) of Simtex Industries Ltd. Simtex Industries Ltd-IPO Lottery Result or Lottery draw will be held on Today,Tuesday,6th October-2015. Place: Helmet (Hall-1), Raowa Convention Hall”, VIP Road, Mohakhali DOHS, Dhaka. Time: 11:00 pm. Total Applied = 16.51 Times. General Applied = 17.65 Times. Affected Applied = 6.19 Times. NRB Applied = 3.96 Times. MF Applied = 42.86 Times.